Sleuthing the Truth in the Media was written for all media consumers who thirst for honest and factual information in mass communications. Straight forward, accessible, relevant for all who are interested in accuracy, Sleuthing the Truth in the Media supports the quest of responsible citizens for informative and truthful media. Peppered with clear examples, Sleuthing the Truth in the Media offers tools to help readers decode the complexities of news reports and advertisements. Readers build skills necessary for becoming proficient truth-seekers as they interact with a variety of traditional and newer forms of news media streams. Readers of Sleuthing the Truth in the Media will gain insights into the newsgathering and publication process, including how a story or advertisement is constructed and produced. Determine whether a report is fully transparent, biased, or false. 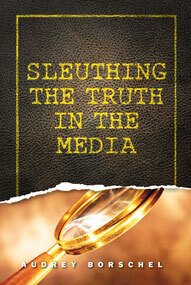 Sleuthing the Truth in the Media places the vast global world of communication in perspective.